One of our non-Irish dogs from Australia. Blaze is a silly little boy who is just starting his show career. Blaze was bred by breeders Rhonda Ruiz and Deborah V. Boyd. Blaze is out of Ultimate Blue Express Surenuf x Encore's Maid in Heaven. Watch for him in 2011. Storm is probably one of the sweetest and gentlest German Shepherd's I have ever seen. A product of Czech and W. German bloodlines, Storm is a beautiful dark sable GSD. He has limited showing in the conformation ring and will be making his debut in the obedience ring in the near future with his junior handler/owner Michael Paulus. 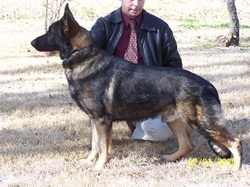 Storm was bred by Mark Bailey and is out of Stryker Schutz Der Ehre x Jackie Van Den Huevel.